A visit to my younger sister’s new apartment required a quick housewarming gift. What to do? I used my new favorite crafting machine, the Silhouette Cameo, to put together some easy personalized gifts. And where better to start than with something I’d never tried before: glass etching. The final project wasn’t perfect (you can ignore the two errant marks from some excess etching cream), but I feel even more confident to try this again. 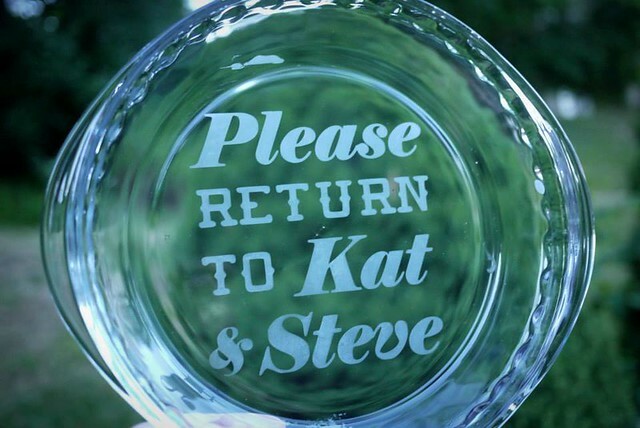 With a bit of care, it’s surprisingly easy to etch glass at home. 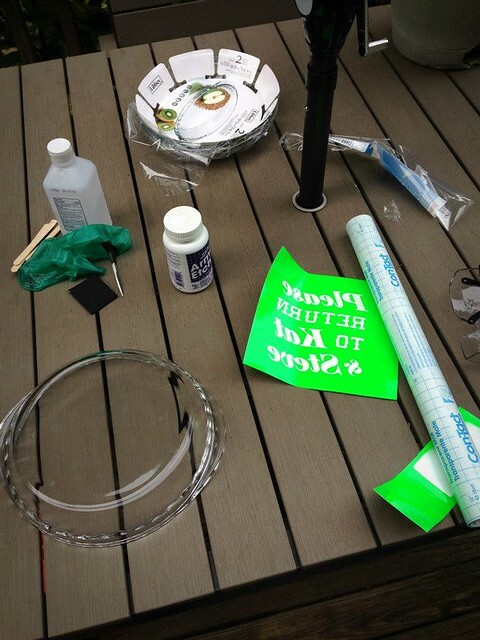 First, I came up with a simple text design and cut it out with my Cameo on scrap outdoor vinyl. 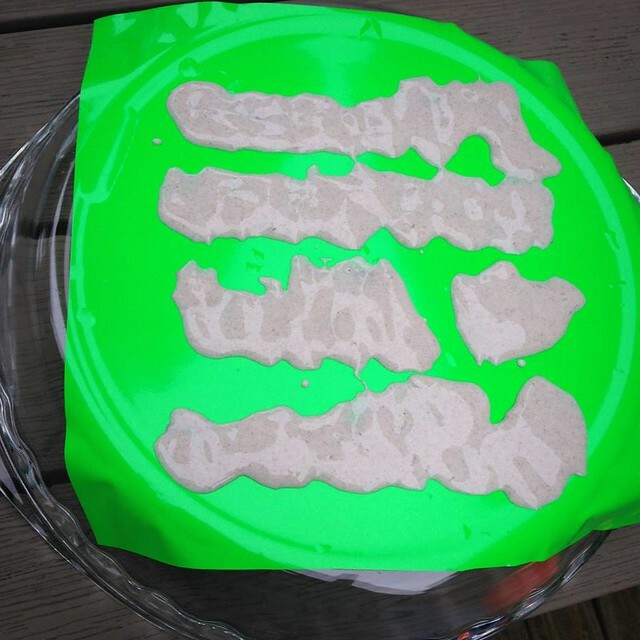 You’ll need gloves, goggles, etching cream, and something to apply the cream — I used a popsicle stick. Don’t skimp on the safety gear. This is icky stuff. Work outside if you can, like I did. To prepare the pan for the cream, I cleaned it carefully with rubbing alcohol. 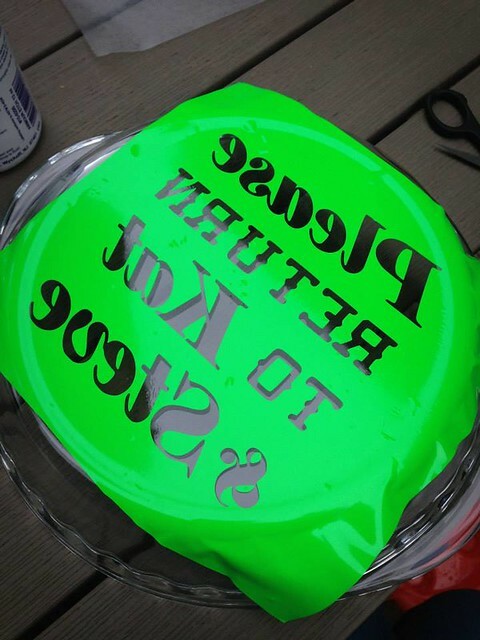 I used my favorite transfer tape substitute — clear contact paper — to center the stencil on the pie pan. Then it’s just a matter of carefully covering all of the exposed areas with etching cream. One thing I would recommend would be to cover more of the area outside the stencil. I managed to transfer some of the cream on my gloves outside of the stencil, which could have been avoided. Lessons for next time! I doubled the etching time recommended on the bottle to get a good, deep etch. Pro tip — the etching goop is re-useable! I scraped what I could back into the bottle, then carefully rinsed off the rest in the sink. Pulling off the vinyl revealed a perfect etch. 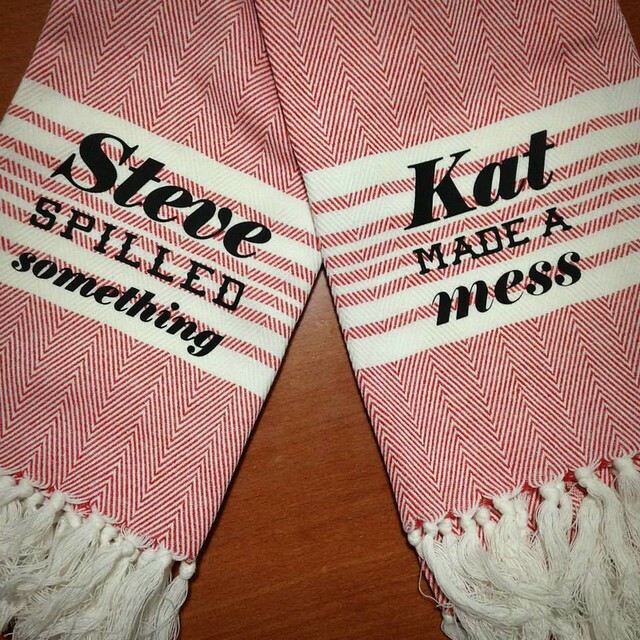 To round out the gift, I used my Cameo again, this time loaded with black heat transfer vinyl, to decorate a pair of kitchen towels. 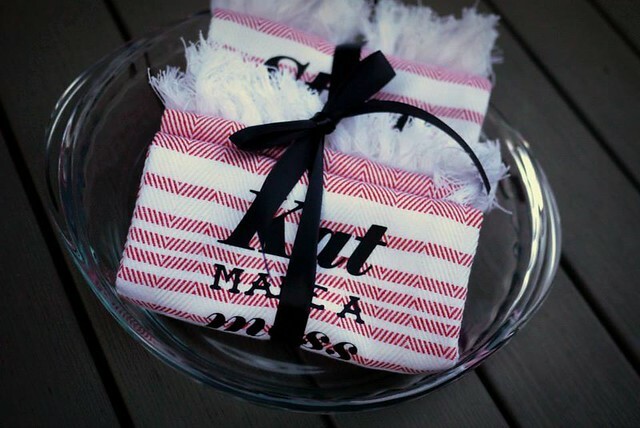 All wrapped up and ready to go, it made for a nice little present. Regardless of your marital status, I hope everyone is enjoying their Valentine’s Day! We keep it pretty low key here — we went to the shooting range (for real!) and then had a nice dinner to celebrate this past weekend. I wanted to do a little something special for him, especially after he had orchids (my favorite!) delivered at my office on Monday. He’s not huge on sending flowers, so it was kind of a big deal. But what do you get for a guy who doesn’t want anything on Valentine’s Day? 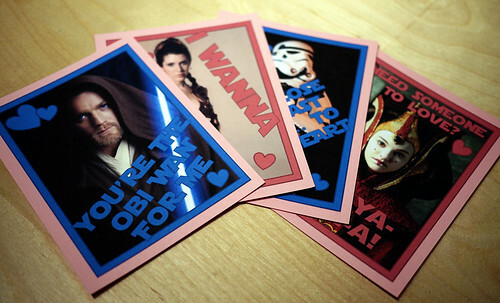 You make him Star Wars valentines. Clockwise from the top left, we have ‘You’re the Obi Wan for me,’ ‘I wanna Leia,’ ‘Don’t close the blast doors… to your heart,’ and ‘Need someone to love? I’m-a-ya-doll-a!’ Yes, the puns are terrible, I’m aware. With the exception of the stormtrooper (saw that one on the net), the foul wordplay is all mine. For the backs, I kept it simple… Leia and Han’s perfect exchange from The Empire Strikes Back. And coupons for cookies, foot rubs, and some uninterrupted ‘Clone Wars’ time. I hate that show. Total cost: $0! I used Word to design the valentines, then printed them on cardstock that I had on hand. They were hidden in his lunch box, with his keys, in his car, and I sent the last one to him via interoffice mail. 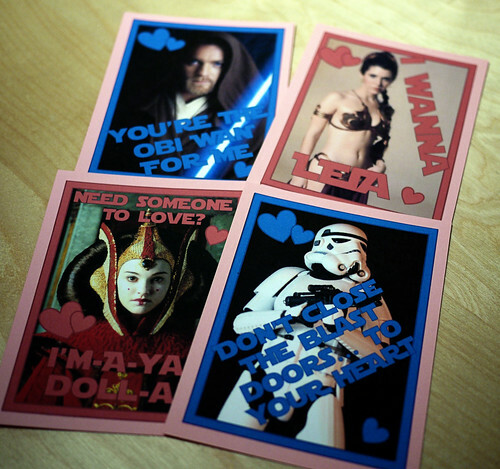 This all may sound silly to you, but I know for a fact he enjoyed it — he hung the Obi Wan valentine in his cubicle! I’m touched. Besides the beautiful flowers, my favorite Jedi also got me a very thoughtful gift — fabric! 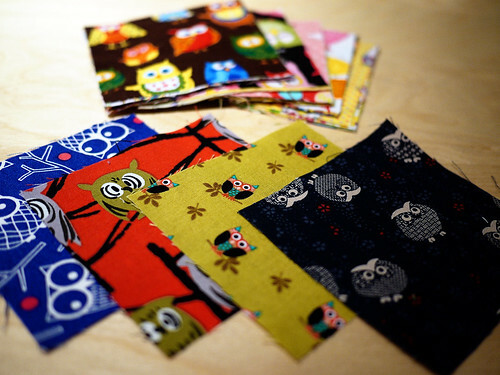 And *owl* fabric, no less. I’m a little obsessed with owls. Apparently he’s taken note of the ceramic hoots that have taken over our house, and got me this charm pack made up entirely of different owl prints. With a little help from yours truly, Santa brought our pup Leela some stylish accessories for Christmas: a new martingale collar and leash. A quick primer on martingales: this kind of collar has no buckle – instead, it is comprised of two loops. One loop goes around the dog’s neck, while the other is used for clipping on a leash. Tension on the leash pulls the collar taut to prevent your dog from backing out of it. 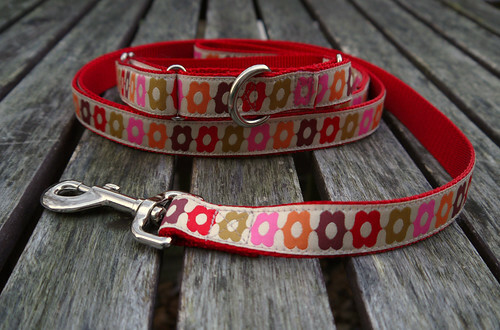 When adjusted properly, a martingale collar fits snugly – but not too tightly – at its smallest setting and provides a comfortable, loose fit in the “relaxed” setting. While there are some cute options when you’re looking at regular collars, I’ve had trouble finding anything outside of plain vanilla in martingales, so I set out to sew one myself. 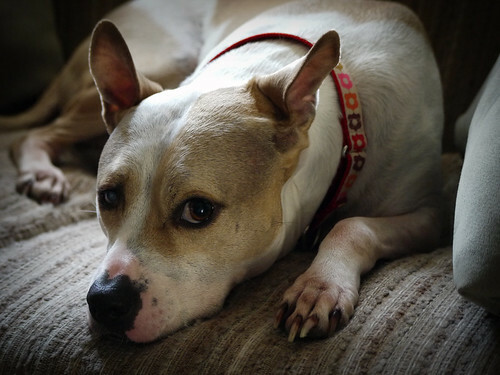 To make the collar, I took measurements from a commercially produced martingale that Leela was already wearing. 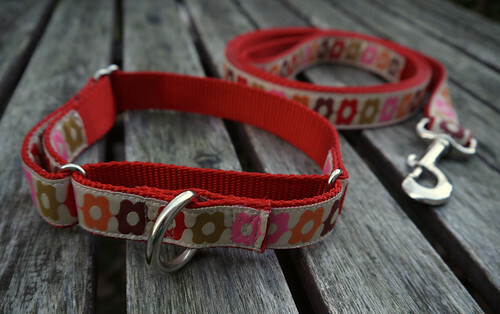 I cut two pieces of 1” nylon webbing for the loops, leaving a long piece for the leash. As an added bonus, I got to use our fireplace lighter to melt the ends of the webbing. Any craft project that incorporates fire gets an A in my book! I sewed some funky patterned ribbon onto the webbing along the edges, then simply mimicked the construction details of her current collar. I made sure to double and triple stitch at stress points, using an "X-box" (square with an X in the middle from corner to corner) stitching method to secure. I have a regular ‘ol cheapy Kenmore machine, but even so, sewing through multiple layers of webbing didn’t present a problem. The leash was even simpler: a loop for my hand, and a metal snap secured at the other end. Three yards of nylon webbing and all the metal hardware (loops, d-ring, slide, and snap) came in right around $7 from StrapWorks.com, and three yards of ribbon cost around $6 from SewSmart Fabrics in Doylestown, PA. Total: $13 for a custom, girly martingale collar and leash set for our little monster!